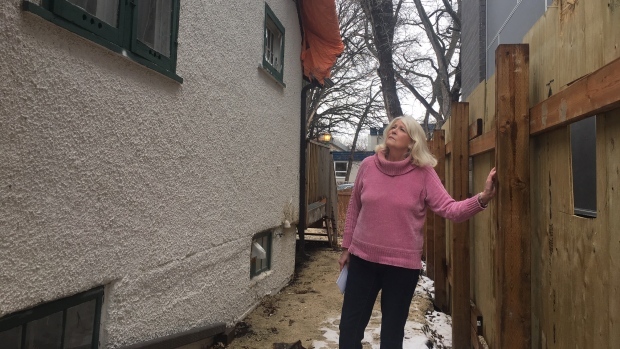 A Winnipeg woman says she waited more than a year for her roof to get fixed. Yvonne Katz, 65, told CTV News Monday it was damaged in October 2017, about 18 months ago. She said when the house next door was being torn down, the chimney fell on her house. She said the demolition company put up a tarp and never came back to fix the roof. “Angry and depressed because nothing’s been done. Absolutely nothing,” said Katz in an interview Monday. As the demolition continued, Katz said life became more difficult. She said the work made her house – about 80 years old – shake, and created more cracks in her ceilings. The company that did the tear down, Smashers Demolition, confirmed to CTV News part of the chimney fell on the overhang of the house but said Monday it can’t comment further as lawyers for both parties are working towards a resolution. Katz also told CTV News that the construction of the new building was also a problem. “It’s not fixable. I can’t live through construction in this house and I won’t,” she said. CTV News spoke with the owner of the property next to Katz. He said it’s frustrating but because of legal proceedings underway he can’t comment. Katz said she’s not aware of a solution coming anytime soon. After a year, she said she filed a lawsuit against all the parties. She said the lawyers from all the parties keep meeting and talking. She wants enough money to move.